Political rivalries, economic competition, heightened nationalism and mistrust hamper the search for a solution to the region’s growing water and energy needs. In its latest report, Water Pressures in Central Asia, the International Crisis Group examines the impact of water issues on shared border areas in the volatile Ferghana Valley; water shortages in urban areas; and competing water and energy needs among the three riparian states of Kyrgyzstan, Tajikistan and Uzbekistan. The report also analyses the international community’s potential to contribute to national and regional stability in Central Asia. Kyrgyzstan is looking at a bleak winter of energy shortages because of low water levels at the Toktogul reservoir and hydropower plant. Energy insecurity and resentment are growing and have proved to be major catalysts in the downfall of successive Kyrgyz administrations. Only mass labour migration and authoritarian tactics have prevented similar upheavals in Uzbekistan and Tajikistan. Attempts at comprehensive regional solutions have foundered on mistrust. The three countries (and international backers) should act in the Ferghana Valley border areas to end annual competition and conflict over water by seeking step-by-step solutions rather than an all-inclusive resource settlement. If Uzbekistan will not join, Kyrgyzstan and Tajikistan should work bilaterally. Uzbekistan’s irrigation system desperately needs modernisation. Researchers suggest that 50 to 80 per cent of water used for agricultural irrigation is lost. The failure in Kyrgyzstan, Tajikistan and Uzbekistan to provide basic services greatly increases the perception that their governments are weak and corrupt and provides a rallying point for opposition movements that seek to oust them. The donor community, including China, the EU and Russia, should support the region in modernising its water infrastructure, building in effective anti-corruption measures and focusing on direct impact at community levels. “Corruption, hidden interests and inflexible positions in all three states hinder a mutually acceptable solution. A common development strategy focusing on reform of agricultural and energy sectors would be in their interest”, says Deirdre Tynan, Central Asia Project Director, “but such an initiative requires a radical shift in the way regional leaders think”. 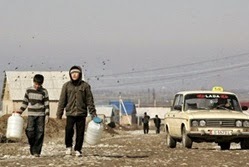 “The failure of Bishkek, Dushanbe and Tashkent to resolve cross-border water problems shows a worrying disregard for stability in their common area. Strained ethnic relations and competition over water and land could be a deadly mix. Conflict in this volatile part of Central Asia risks rapid, possibly irreversible regional destabilisation”, says Paul Quinn-Judge, Europe and Central Asia Program Director.